An excellent and not particularly difficult walk to the summit of Mt Cobbler starting at the attractive Lake Cobbler. From Lake Cobbler follow the sign-posted track to Mt Cobbler as it follows an old vehicular track initially, before leaving to drop down and cross a small creek. Some of the track markers in this area have been burned, so are hard to see. From the other side of the creek the path climbs steadily through forest until it reaches a track junction. From here turn right (north) and follow the path as it breaks through the treeline onto the Cobbler Plateau. Walk up the rock slabs (a path is marked by occasional cairns but in good weather you won’t need them) as you walk up this section you’ll probably wonder how the summit will be reached as it is cut off from the main ridge. Fortunately there is a small land bridge that connects the two; some simple scrambling is required, although it’s steep on all sides so a head for heights would be useful. After exploring the summit area and taking in the superb views, return to Lake Cobbler via the same path. Access: Lake Cobbler is about 50km south of Whitfield, along a forestry road that is unsealed for the most part. My car is an all-wheel drive Subaru Forester which had no problems negotiating the track, access by 2WD should be possible with care in dry weather – note that there is a steep climb up from the upper Dangdongadale River valley and a short ford just before Lake Cobbler is reached. 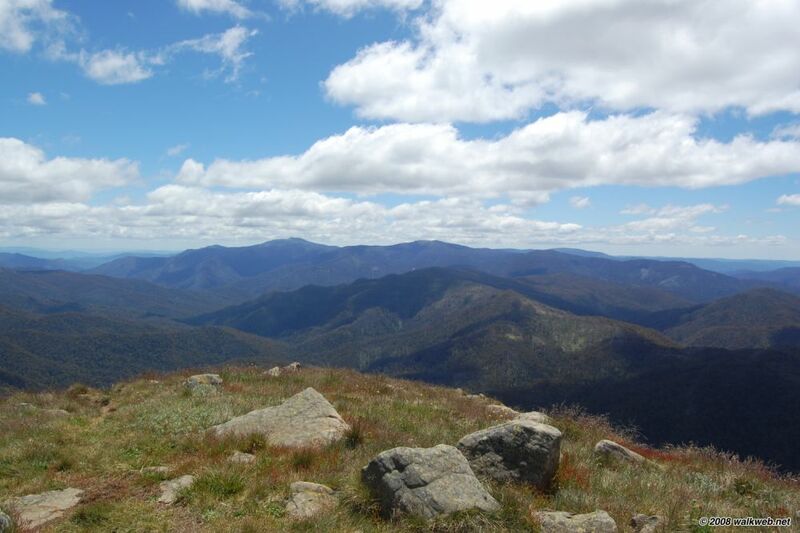 Just returned from a couple of great days walking in the Wonnangatta-Moroka area of the Alpine National Park. Walk descriptions to follow shortly; a photo gallery is available here (nb. requires modern browser and broadband connection).